"...Where All We Do is Win Championships." 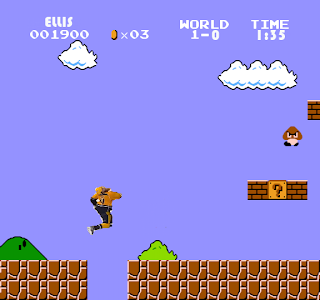 (Welcome to "Hockey After Dark!" This writing space WAS my personal take on the 2017 Stanley Cup Playoffs, but will now become a delectable smorgasbord of gloating, trolling, and outright schadenfreude in wake of the BACK-TO-BACK CHAMPIONSHIPS OF **OUR** PITTSBURGH PENGUINS! The referees for sporting events get things wrong all of the flippin' time, especially in hockey. Tell a Buffalo Sabres fan that Brett Hull's Cup-clinching goal should not have been disallowed due to the rules at the time, and you'll probably get slapped. Heck, the Pittsburgh Penguins were victims of a missed offsides that was so blatant that the NHL instituted the much-maligned "Coach's Challenge" (oh yeah! sorry again, Nashville!). Let us begin our image dissection with the obvious: the referee never should have blown the play dead. 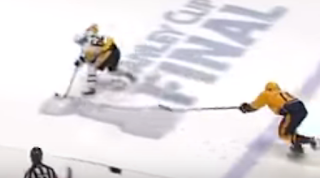 Kevin Pollock, the unseen referee to the left of the above action, blew the whistle because he was screened and couldn't see the puck, and assumed that Matt Murray had it covered. Having established that– what the hell is Olli Maatta (#3) doing for the Penguins? He's literally going in the opposite direction from the man he's supposed to be defending. 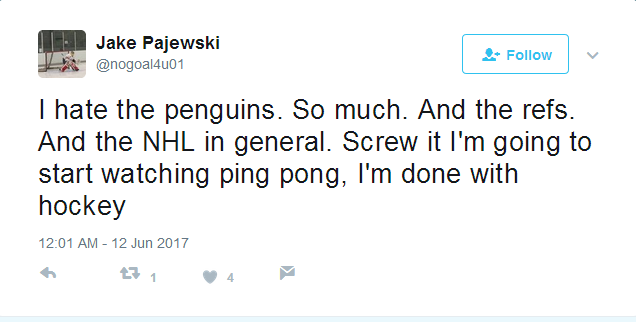 Thanks to the quick whistle, the out-to-lunch Maatta was spared the social media rod in lieu of poor, poor Mr. Pollock. 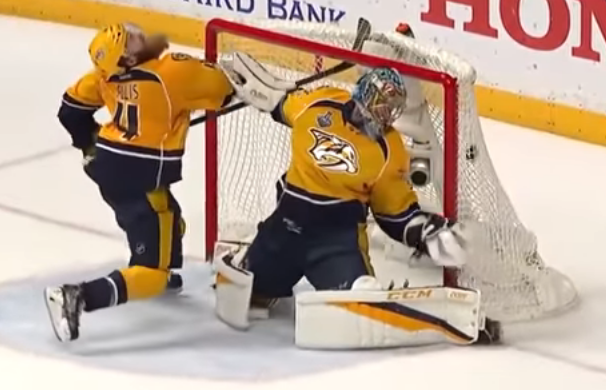 This image shows Filip Forsberg raising his arms in incredulity well before Colton Sissons poked the vulcanized rubber into the yawning net. Bad whistle, but not a goal. Pollock and the rest of NHL referees then proceeded to do what NFL referees always do whenever they feel bad about an officiating mistake: NARRATIVE SHAPING! The Predators were given every power-play in the game (four of them), and were even given an absurd 5-on-3 opportunity to score in the 3rd period, but Nashville was unable to convert. 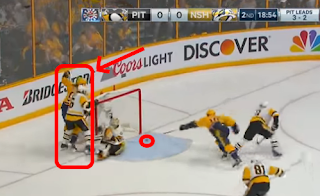 Of course, said missed opportunities came back to haunt the Predators when former Predator Patric Hornqvist banked a puck in off of an overly aggressive Pekka Rinne and put the Penguins up 1-0 with just over a minute left in regulation. Please note that Pekka Rinne is clobbering his teammate Ryan Ellis in the face. This is PK Subban failing to keep the puck in the offensive zone. 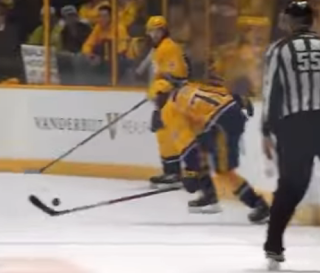 This is PK Subban using his slashing stick to wave "GOODBYE!" to Carl Hagelin. ...and thus began the second Nashville "throwing something on the ice" tradition following catfish: garbage. Yes, the "Trashville" Predators littered the ice with objects with their team down 2-0 with only a handful of seconds left to go. I'm starting to sense a pattern. 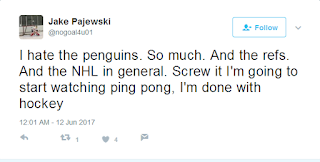 Dear "Bitter Flyers Fan," is there actually any other kind of Flyers' fan? I'm happy to see ice hockey take off and develop in a non-traditional market such as Nashville, and again, had the Predators been playing any other team from the Eastern Conference, I would have been cheering them on (as I would have hypothetically cheered on the San Jose Sharks last year). 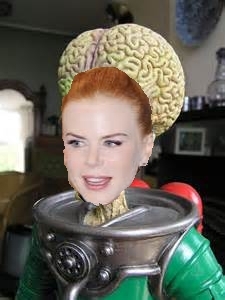 Instead, I got to cheer for MY favorite team, and MY favorite team managed to overcome injuries, bad officiating, a league office unwilling to suspend players for dangerous plays, and Nicole Kidman's scary, alien forehead en route to winning their 5th Stanley Cup. Really, I'm thrilled. I'm excited. But above all else, I'm exhausted, because it's 4 AM...but I can't help but hit REFRESH / REFRESH / REFRESH on media platforms because I simply can't get enough of this iteration of the Pittsburgh Penguins. We know that Cullen will retire, and that Fleury will either be taken by the Las Vegas Golden Knights during the expansion draft or traded prior. We can also speculate that the Penguins will try their utmost to retain the services of Nick Bonino and Justin Schultz, but nothing is guaranteed. This team, as it's currently constructed, simply won't exist in a few weeks, so I'm taking it all in. We're living in the Golden Age of Pittsburgh hockey: I've seen the Penguins capture 5 championships while Philadelphia works toward 50 years without a Stanley Cup parade. Enjoy this team, celebrate as much as you want, because there are absolutely no guarantees in life or sports. Phil Kessel is a TWO TIME Stanley Cup Champion! !